Agnes and Clarabelle are best friends, and that means everything es better when they are together. This is the soul of this inspiring book. Many sweet stories talk about Agnes and Clarabelle friendship. A surprise party for Clarabelle, that Clarabelle helps to organize too. Agnes' fear of the beach, and how her friend is there to support her and accommodate the plan so everybody has a good time. Agnes' turn of being supportive comes when Clarabelle feels frightened of getting lost in a huge store. And what makes a perfect pizza? Is not the chestnut and chocolate chips toppings, but the joy of making it together. This short novel for early readers is divide in four chapter/stories called after the seasons that can be read independently. 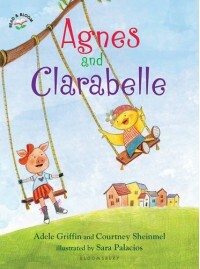 Agnes and Clarabelle are lovely characters, and their stories will make you smile. They remind me in some way the old Little Bear books, where the focus is put on the good things we can do and experience together. Agnes and Clarabelle have this kids of purity and blessedness. The illustrations are gorgeous. Look at that cover! 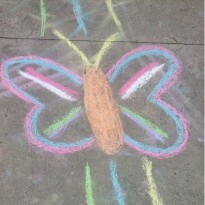 Colorful and uncomplicated. Bright and with texture. I felt like jumping into the book! Thankfully the stories are thoroughly illustrated. Wonderful option for reading aloud at bedtime, or for independent readers. I received this copy from the publisher via NetGalley in exchange for an honest review.